Spring hit like a deep breath of fresh air and a long sigh of relief this year, and I've been soaking it in as much as I can. The flowering trees, especially, have the power to set my heart still so that no matter what I'm doing, I can't help but stop and think of how much I love them. There are a few on my way to and from work that remind me of cotton candy climbing up the branches. There are a few on my jogging route around the neighborhood that have big white blossoms. And the ones outside my apartment are small and dainty, and today they rustled in the wind and fell to the ground like snow. Which made me think of how something so new can suddenly become so familiar. 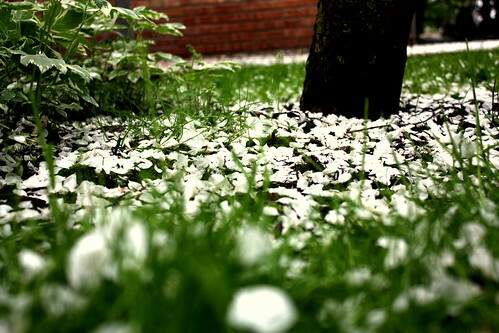 The blanket of petals that covered the ground today was slippery and white, not unlike the layers of snow that we lived with for so many cold months. When we relied on thick socks and comfort foods to get us through the day. I think it's safe to say that I welcome the snow shower of petals much more happily than I would, well, an actual snow shower. While the petals fell outside and made room for summer greenery, the food inside was also both new and familiar. On Saturday, there was the new: this lemony chickpea stir fry from 101 Cookbooks that I made for my friend Jenna, who is back in Chicago after months of living in Guatemala, and is moving to Ecuador in just a few weeks. (Talk about coming back to the familiar after so much new!) The original recipe calls for summer squash, but I used asparagus instead, and added a handful of colorful sliced radishes, because have I mentioned that it's springtime around here? And tonight, for Sunday dinner, there was meatloaf. Meatloaf is still somewhat new to me, as I never grew up on it and I actually made it for the first time a few weeks ago. But there is still some familiarity to it, as the ingredients are as everyday and comforting as it gets -- ground beef, onions, tomato sauce, bread crumbs, eggs. And though tonight was only the second time I've ever made it, the recipe is so simple that it felt like an old favorite, one that I can put together with my eyes closed, if need be. Almost a year ago, spring had just begun around these parts. And even then, I was writing about the familiar and the new. The very, very new. Yet another reason for me to love the flowering trees, and spring, and all that comes with it. Heat 1 tablespoon of the olive oil in a large skillet over medium-high heat and stir in a big pinch of salt, onion, and chickpeas. Saute until the chickpeas are deeply golden and crusty. Stir in the tofu and cook just until the tofu is heated through, just a minute or so. 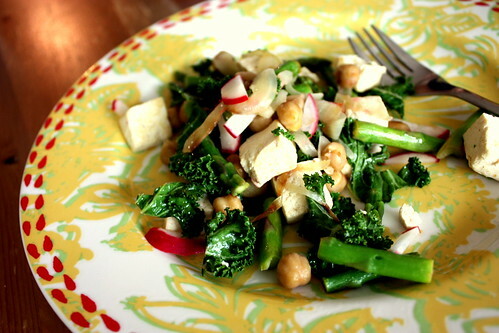 Stir in the kale and cook for one minute more. 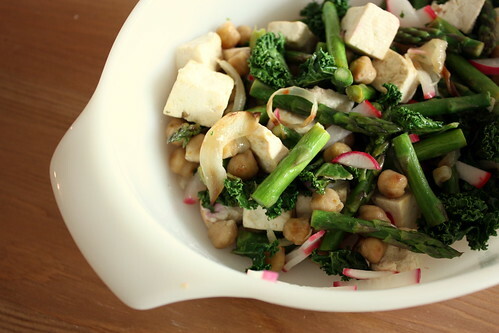 Remove everything from the skillet onto a large plate and set aside. In the same skillet heat the remaining tablespoon of olive oil, add the asparagus and radishes, and saute until it starts to take on a bit of color, two or three minutes. Add the chickpea mixture back to the skillet, and remove from heat. Add lemon juice, salt, and pepper to taste. Combine beef, 1/2 cup pasta sauce, and remaining ingredients except cooking spray in a large bowl. Shape beef mixture into an 8 x 4-inch loaf on a broiler pan covered with aluminum foil and coated with cooking spray. Brush remaining 1/2 cup pasta sauce over top of meat loaf. Bake at 350° for 1 hour and 10 minutes or until a thermometer registers 160°. Let stand 10 minutes. Cut loaf into 12 slices. Serves 6. Mmm, I love meatloaf. 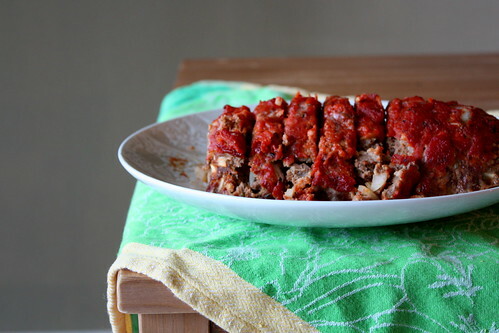 I actually never make it, but have this strange compulsion of collecting various recipes for meatloaf--from Southern Cooking to The New York times. Your post has given me a much needed nudge to break one out! Love the beautiful spring photos as well (thank god, huh?!) Looks like a good weekend! 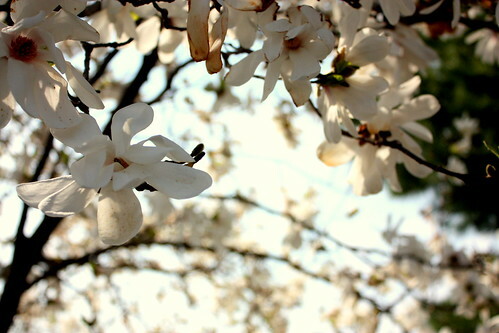 There is nothing like those springtime flowering trees, rich with their scent and so easy on the eyes. I love how the aroma carries as the night cools down, and the petals shimmer in the darkness. They intoxicate me. 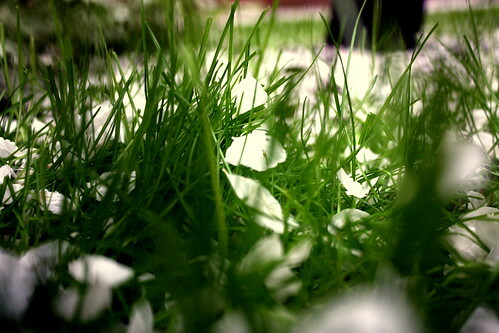 Love your photos... especially the petals on the grass. 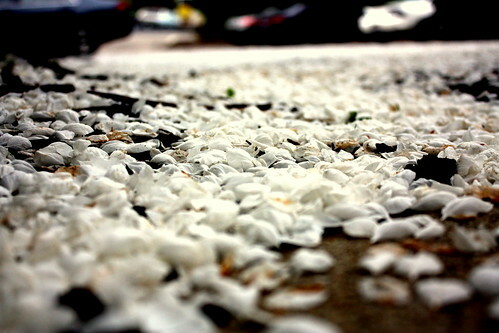 I love, love, love that photo of petals on the ground. So beautiful! What gorgeous blossoms! 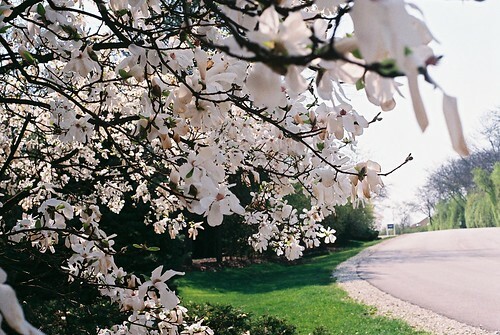 I wish we had that kind of beautiful spring here. I just found your blog, it's so lovely! 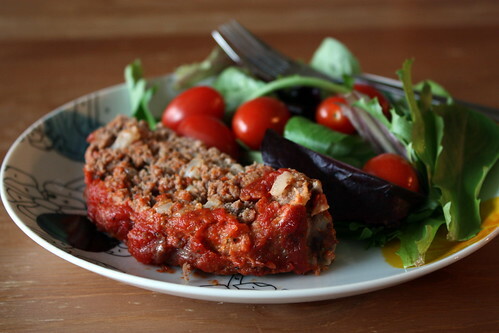 megan - yes, you should definitely make some meatloaf! it makes such great leftovers, too. thanks for the nice comment -- this has been the prettiest spring yet around these parts. 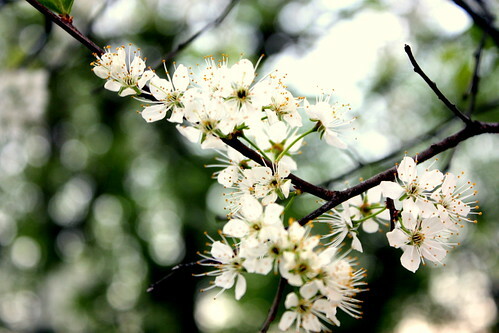 kate - the smell of flowering trees is certainly something else. and although it would be nice if they were in bloom year-round, i kind of like that they eventually fall to the ground. makes them that much more special. thank you! darby - thank you! the grass and sidewalks were wet that day, so i got kind of dirty taking pictures, but it was worth it! char - i totally agree. thanks for your nice comment, as always! ulrika - hi, thanks, and welcome! glad you could stop by. hannah - we haven't a spring like this in a long, long time. at least it seems that way. glad you found my blog, and thanks for saying hello!